So, today I’m going to talk about weapon swaps. Sometimes the weapon that a model wants to use is simply unavailable or requires buying a kit for just one bit. Perhaps the way the weapon is posed is not quite right or you want a WYSIWYG model and your model doesn’t have quite enough hands. If this is the case then it’s time for a weapon swap. 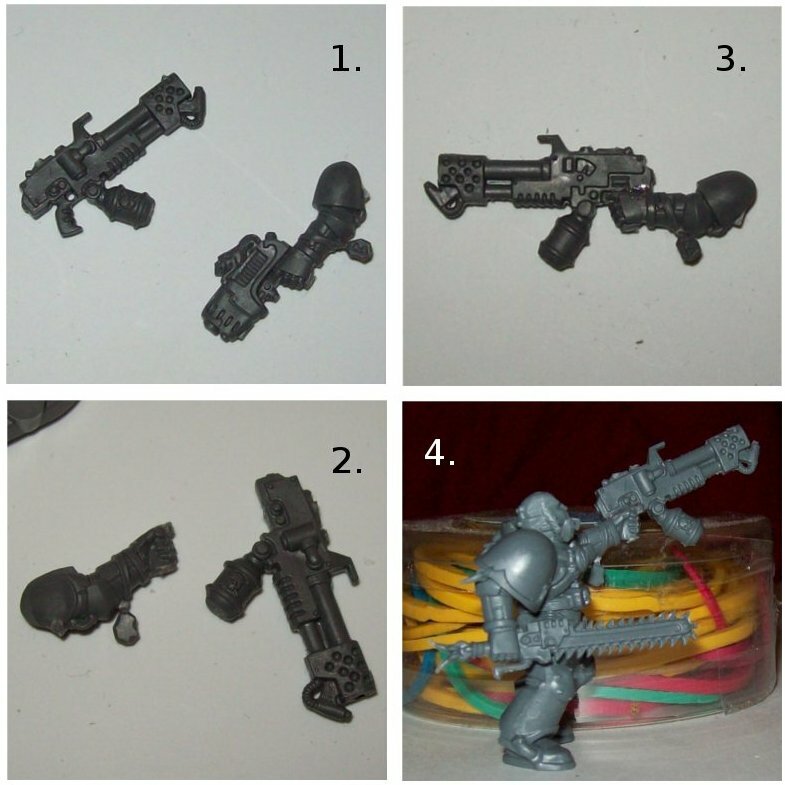 Some weapon swaps are trivial, for instance in building Long Fangs from the Devastator kit or giving a model a sword or pistol from another kit. It gets a little more complicated when you need a weapon for which you don’t have the kit or want to pose the weapon in a different way. I’m going to cover reposing of limbs in a later post so today I’m just going to look at what the limbs are holding. So what should we consider when doing a weapon swap on a model? The first thing to think about is how the weapon is going to be fixed to the model. Is it in the model’s hand ready to use or is it stowed? Is it one-handed or two handed? If it’s stowed, does it need strapping down in any way? If it’s in use, is it in one hand or two? In which direction do you want it to point? Below are some examples of stowed weapons. 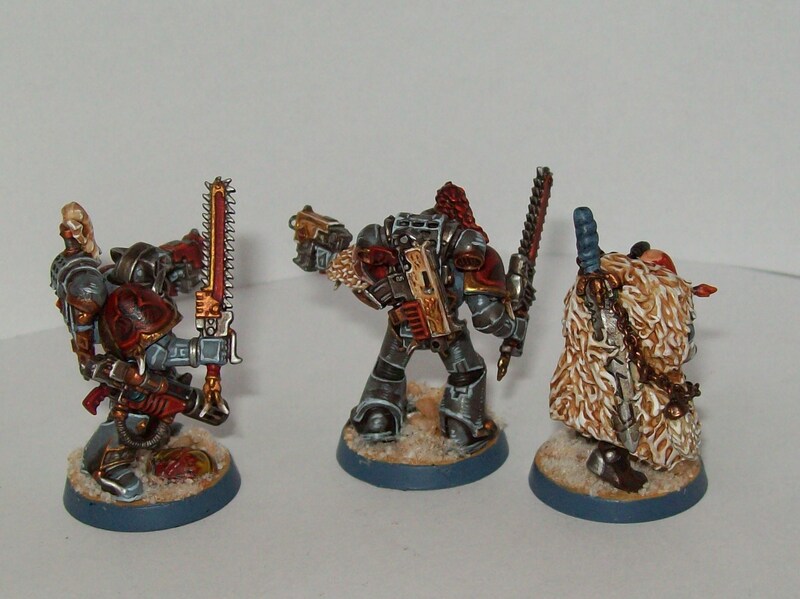 The sword that the Wolf Scout is carrying is a cut down power sword from the Space Wolves pack (representing a combat knife). I had to build up the hilt with green stuff and I added the chain to make it look as if it were strapped on. I also built the green stuff fur cloak around the blade, so that the sword blends in with the rest of the model. The meltagun on the first Grey Hunter is slung from a sling made from green stuff. Here, I just glued the meltagun to the thigh of the model and used two thin bits of greenstuff to make it seem as if it is slung from a strap over his shoulder (don’t you just love big shoulder pads sometimes). The final stowed weapon is the simplest. I just glued the bolt gun to the backpack to represent a weapon that is maglocked in place. So, stowed weapons are fairly straightforward. Now we come to weapons modelled as if they’re in use. The trivial example (although it doesn’t feel like that when you’re juggling arms and bolters) is swapping out a bolt gun for a plasma or melta gun. A more dynamic pose can be made by having the model wield the weapon one-handed. For the flamer wielding Blood Claw below I used a plasma pistol wielding arm from the Space Wolves Pack box and a flamer from the Tactical Marine box (1). I trimmed off the plasma pistol using a scalpel and trimmed the grip area of the flamer to match (2). Then it was straightforward to glue the two pieces together(3-4). 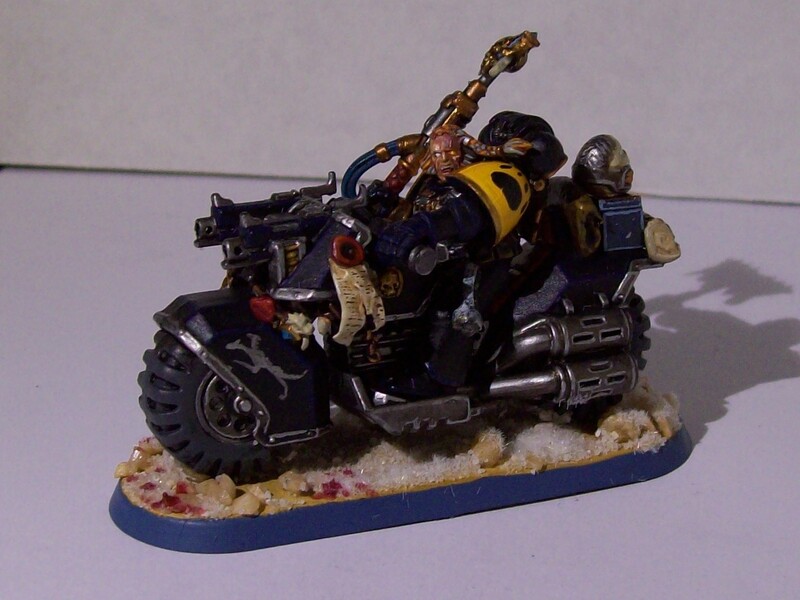 Then there are weapons and items that do not exist, for example the only Space Wolf Crozius Arcanum comes with Ulrik the Slayer. Fortunately it’s very easy to make your own. 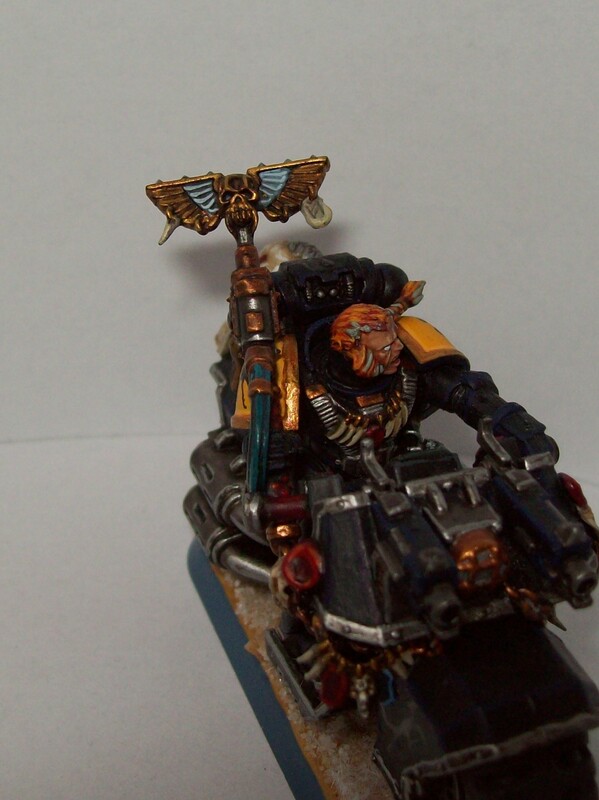 All you need is a thunder hammer (of which you’ll have plenty if you own the Space Wolves Pack kit) and one of the backpack icons from either the Space Wolves Pack or Terminators kit. Trim off the head of the thunder hammer and glue on the icon. It really is that simple! So, what should you try to remember when kitbashing or converting weapons. Well, firstly, you need to consider what the weapon represents. For example I built my Rune Priest with a staff, which caused no problems when I fielded him in 5th Ed., but caused me much confusion when I first got him into close combat in 6th (it should be a power stave). The next thing to think about is the aesthetics- how you want the model to look. For instance if you want a WYSIWYG model you need to work out how to fit everything on which, when you have a model with two or more weapons, stops being trivial very quickly! The third thing that you need to consider is transport and storage. Unless you only play at home and store your figures on a shelf, you will need to be able to pack up and move your models. If you want to kitbash or convert a model with a particularly epic or thematic pose you may want to think about either keeping everything close to the body of the model (for ease of packing) or using magnets. Hopefully this post gives you a few ideas about how to be creative with a weapon swap. In the next post of this series I’m going to look at reposing limbs. Until then! 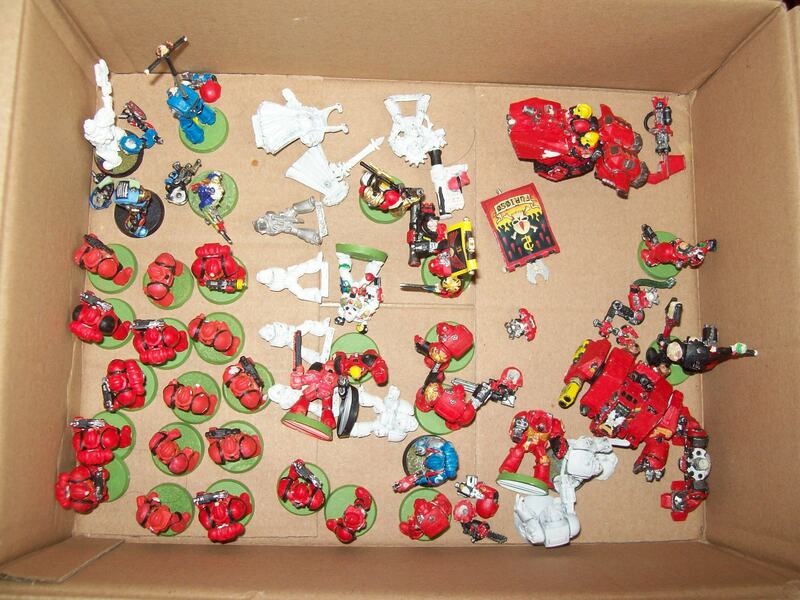 They’re my boyfriend’s old Blood Angels from when he was a teenager along with a couple of other interesting bits (Eversor Assassin and Rogue Trader era Inquisitor). I need to strip them of any old paint and undercoat and tidy them up before I can repaint them for him. They’re not an urgent job, just something to potter along with when I need a break from my Wolves but I’d like to do it well, which is why I need to figure out the best way to strip them. Now metal is fairly easy to strip but there are quite a lot of old plastic arms and banner poles mixed in with the metal so I decided to do an experiment to compare different ways of stripping miniatures. The data given below are for the brands/varieties of products that I have used. I cannot guarantee that every brand will work the same way. This article is just a guide. Before using any medium to strip your miniatures please, please do a test piece first! I do not take any responsibility for any damage or destruction of models due to use of the information on this page or for the use of any products in a way not intended by the manufacturer. Read the instructions on the bottle before use! Some of the products used below are irritants and/or produce fumes. Always work in a well ventilated environment and keep any solvents out of the reach of children and animals. Protective clothing such as gloves and goggles may also be advisable. Foaming Kitchen Spray: C1000 Keuken Powerreiniger Lemon: I know that traditionally Fairy Power Spray is used but having discovered that normal kitchen spray is good at cleaning paint residue from the sink I wanted to see if it worked to clean models. There are lots and lots of generic degreasers out there so I recommend shopping around to see what’s best for you. I prepared the test samples by spraying with Chaos Black undercoat and coating with a layer of Citadel Layer paint. To run the experiment I simply soaked the test pieces in the solvent and periodically tested them by scrubbing gently with an old toothbrush. 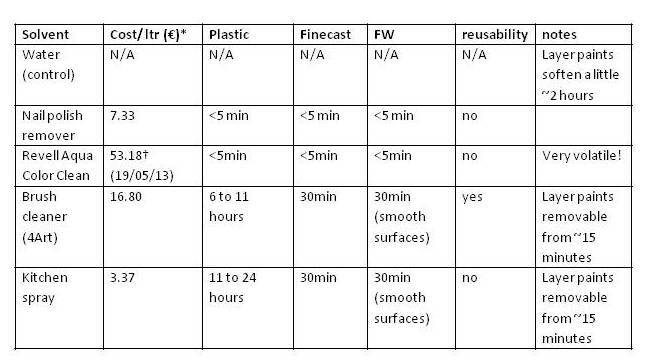 In the table below I have put the results of the experiment along with the cost per litre, whether the cleaner is reusable and any notes. * Cost per litre in euros calculated 19/05/13 for the products used. The cleaners used above were all suitable for plastic, Finecast and Forgeworld resin. Surprisingly, the two resins were far easier to clean than plastic, possibly because they do not hold the primer so well. From the results I recommend picking the cleaner for the job. The nail polish remover and the Revell Aqua Color Clean brush cleaner worked the fastest of the cleaners used, however they do produce a lot of fumes. They also evaporate quickly. Indeed, the Aqua Color Clean is so volatile that it evaporates faster than it can be used, particularly in a shallow dish. For this reason, as well as the cost issue, I prefer to use nail polish remover out of these two solvents. For single models or situations when quick cleaning is required I would say that nail polish remover is probably the most effective. However, I would recommend testing it out first as not all nail polish removers can be used on plastic models (as I know from experience). The only cleaner to not produce fumes is the oil based brush cleaner, which is also the most reusable of the cleaners used. Its performance is similar to that of the cleaning spray. For cleaning large numbers of models or regular stripping of miniatures, these two cleaners are probably most effective, especially as, since the cleaners are non volatile, the models can be left to soak quite happily. Cleaning Spray is also the cheapest option, particularly as it’s an everyday household product that you may already have at home. How much are you going to strip? If you only have one model to strip, I’d recommend the nail polish remover as it’s quick and relatively cheap (you need 20ml rather than a litre of the stuff). For a lot of models, the kitchen spray or the oil based brush cleaner are probably more economical, while for somebody who regularly buys things off Ebay or Bring and Buy stalls, a tub of the reusable oil based brush cleaner might be most practical. Where are you going to work? The nail polish remover and the Aqua Color Clean require well ventilated areas. If you don’t have a well ventilated space to work in, I’d steer clear from working with these. How fast do you need it done? 24 hours before you need the model painted, based and sitting on the gaming table is far, far too late to worry about using kitchen spray. What can you get? I was trying hard to get Dettol for this experiment but I wasn’t prepared to travel to the next city to get it. Kitchen sprays are fairly easy to get from the supermarket, and, in the UK and The Netherlands at least, you should be able to get nail polish remover there too. If you can’t get hold of a product easily, you’re probably better off looking at one of the many alternatives. This article doesn’t show every method for stripping miniatures but hopefully it gives you an idea about how to choose your stripping medium. Whatever you use, do try a test model first and good luck! You’ve possibly heard me moan about female models before, it’s something that I find vaguely curious, both from a personal point of view, I’d like to build an all or majority female army some time in the future, and a more general point of view, regarding the portrayal of the female figure versus that of the male one (and the whole big boobies thing). However, today I’m feeling all positive about female models, thanks to the new High Elves. I have to admit that High Elves by themselves don’t really interest me and my first instinct upon opening White Dwarf was to giggle at the names of the two phoenix models, who sound as if they were named by teenage girls (there’s a strong teenage girl vein running through a lot of the new High Elf releases to be honest- it’s kind of sweet). However, upon looking again at some of the pictures I spied two units that really interested me model-wise: The Sisters of Avelorn and the Handmaiden of the Everqueen. I really, really like these models, not just because of what they are, but also because of what they represent. In these two kits Games Workshop have given us female warriors who are exactly that. They’re slender rather than dangerously buxom and they’re clad like, well, warriors. The Handmaiden of the Everqueen shows a bit more flesh, but wow, she looks like she means serious business. This is what I like to see in female models, the same things that I look for in male, monstrous or robotic models, figures that represent what the character is. I think that these two kits really do that. I have to admit that I don’t know any of their rules, but they’re described as either archers or a bodyguard and they look like that! It’s a pity about the little hearts everywhere, but that seems to be the teenage girl influence again. I’m not so keen on the Everqueen herself, but I think that might be the painting style. The eyeshadow and lipstick make her a look a little bit more of a tart than a fairy queen! I’m tempted to buy the Handmaiden, but I really shouldn’t, I still haven’t painted Valkia yet and, unlike Warriors of Chaos I don’t like the whole army enough to consider picking them up (I’m still avoiding taking up Warhammer Fantasy- just). However, I like these models and I really wanted to highlight them with a blog post. I don’t give marks out of 10 but they’d be a solid 9 or 9.5 if I did (losing half a point for the twee little hearts). Anyway, I should get back to my painting, so that I have models ready for my next kitbash post. If I haven’t managed to persuade you to at least take a look at these models by now, I never will!